/ Best Calzone in Destin FL / LET’S MAN UP Cuz it’s FREEDOM FRIDAY – YOU’VE STILL GOT ROOM TO EAT! 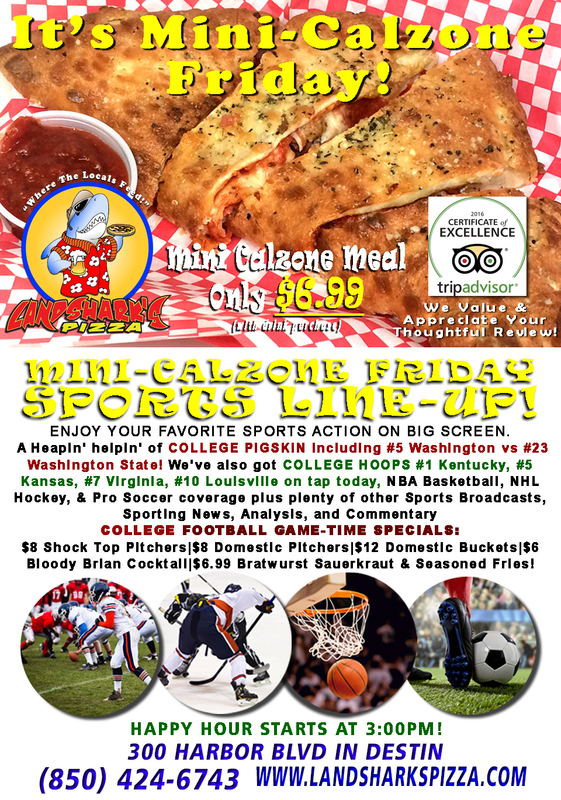 $6.99 Two-Topping Mini-Calzone, COLLEGE FOOTBALL & HOOPS $8 Pitchers & LOTS MORE! LET’S MAN UP Cuz it’s FREEDOM FRIDAY – YOU’VE STILL GOT ROOM TO EAT! $6.99 Two-Topping Mini-Calzone, COLLEGE FOOTBALL & HOOPS $8 Pitchers & LOTS MORE! 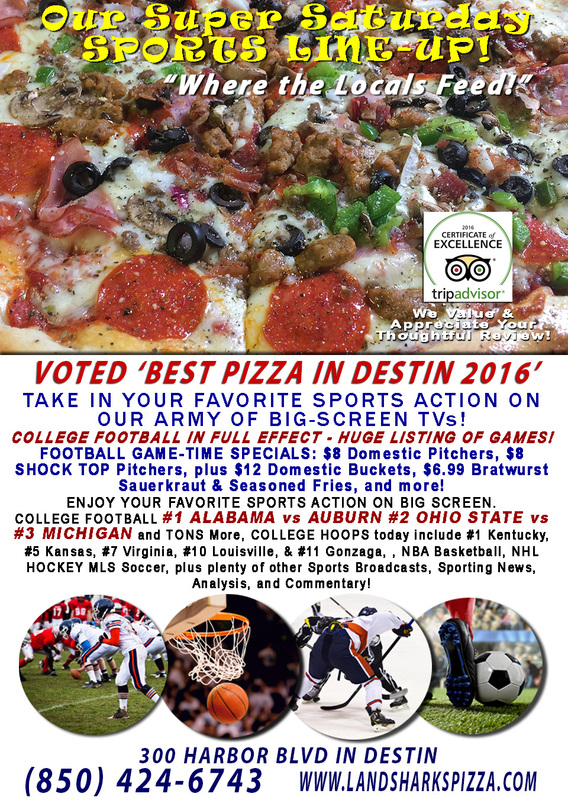 TURKEY YESTERDAY MEANS ITALIAN TODAY – PIZZA, CALZONES, & SPORTS IN DESTIN! Destin’s favorite day has arrived with sunshine in tow! Enough with the turkey already – CHOW DOWN ON A MINI CALZONE, TWO TOPPINGS, OVEN-FIRED, TOTALLY FILLING FOR ONLY $6.99 dine-in with drink purchase. 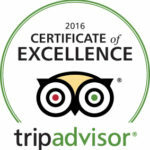 We are inspiring the nation with hot, melty, tasty, cheesy goodness at a budget-friendly price on Destin Harbor! 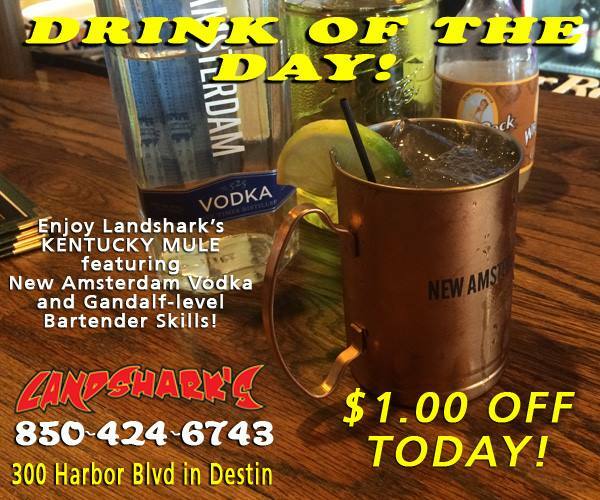 LANDSHARK’S DRINK OF THE DAY – $1.00 OFF OUR ‘KENTUCKY MULE’! This is a kick in the head you’ll enjoy – the adult cocktail that’s stubbornly good! SPORTS ON OUR ARMY OF BIG SCREENS – A Heapin’ helpin’ of COLLEGE PIGSKIN including #5 Washington vs #23 Washington State, #21 Western Michigan #20 Boise & #16 Nebraska! We’ve also got COLLEGE HOOPS #1 Kentucky, #5 Kansas, #7 Virginia, #10 Louisville on tap today, NBA Basketball, NHL Hockey, & Pro Soccer coverage plus plenty of other Sports Broadcasts, Sporting News, Analysis, and Commentary! NFL This Week: Full slate of Sunday games & Next Monday Night (28th) NFL PACKERS vs EAGLES! NCAA Football This Week: Full serving of smashmouf on Saturday! Previous Post: « SO THANKFUL IT’S WINGSDAY! 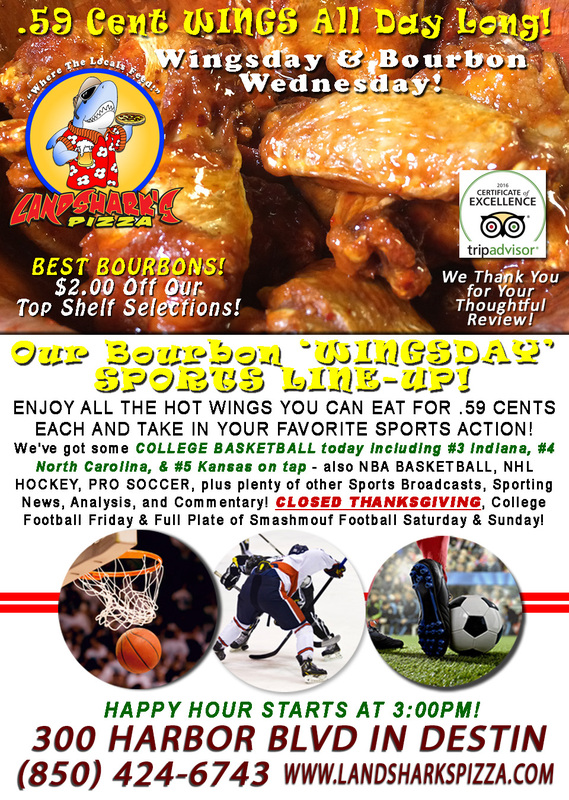 59¢ Wings & $2 OFF BEST BOURBONS in Town – TONS of Top-Ranked COLLEGE BASKETBALL!